Abstracts for all presented short papers, workshops and short thunderstorm sessions. Where we have them, these abstracts also link to presentations, audio and video recordings from the day. All submissions for #SocMedHE15 were double blind peer reviewed. Full papers went through further a double blind peer review process. The conference proceedings are currently located here on the main conference website. At some point, we anticipate that they will move to a permanent open journal home, managed centrally with other publications from Sheffield Hallam University. To bookmark, or refer to the proceedings please use the short URL: http://go.shu.ac.uk/socmedhe/proceedings, and we will update the destination page when this location change takes place. The content is available via open access which means that all content is freely available without charge to the user or his/her institution. Users are allowed to read, download, copy, distribute, print, search, or link to the full text of the articles, or use them for any other lawful purposes, without asking prior permission from the publisher or the author. This is in accordance with the Budapest Open Access Initiative (http://www.budapestopenaccessinitiative.org/read) statement of open access. 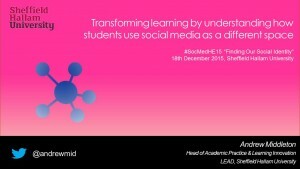 #SocMedHE15 took place on 18th December 2015. 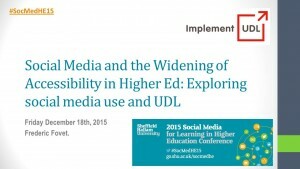 The overarching theme of the conference is the use of social media for learning in Higher Education. The conference was designed to create a forum for academics, their students, developers and strategic managers to consider the opportunities, challenges and the disruptive influence of social media for learning. 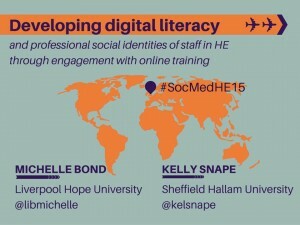 Defining an Emerging Occupation: Who is the Social Technology Enabled Professional (STEP)? 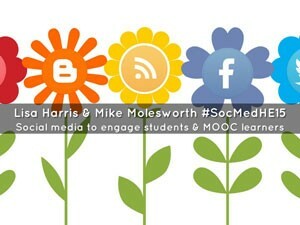 Social media establish a new space for learning that is neither owned by the learner nor provided by the institution. Lack of ownership presents a challenge for pedagogic design. We will explore this rich extended learning space by collectively developing a set of design principles derived from literature and experience. 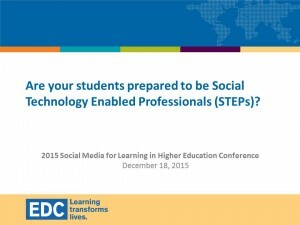 Are you preparing your students to be Social Technology Enabled Professionals (STEPs)? Attendees will be introduced to materials created by a panel of U.S. social media experts that identify the work responsibilities of a Social Technology Enabled Professional (STEP) and provide guidance on measuring the performance of those responsibilities. The session will demonstrate how the materials can be used to build training curriculum. 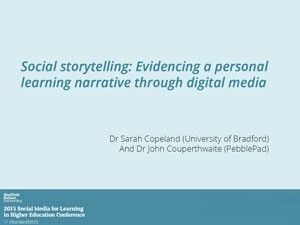 We propose to invite participants to explore the relationship between sharing of narrative and gathering evidence as a social learning framework. We aim to facilitate workshop activities centred on portfolio-based learning, digital storytelling, and assessment through a connectivist learning model. This session will explore the role of social media in defining your “professional brand”, the key building blocks for a strong brand, and how it can play an influential role in marketing you (and your business / institution) as desirable to work with. This workshop draws on findings from a survey of copyright literacy levels amongst librarians and related professionals (Morrison & Secker, 2015). Participants will explore some of the challenges that social media presents and consider the best ways of supporting staff and students to use social media ethically and legally. Social media – accessibility and inclusion, benefit or barrier? Social media opens up a range of new opportunities for disabled learners. It has inclusion benefits in encouraging collaboration, reflection, peer feedback etc. However, different social media have different accessibility issues so you can unwittingly create barriers for some whilst removing them for others. This workshop explores problems and solutions. This workshop aims to explore storytelling on social media as a way to enhance elementary journalism skills at the UG and PG levels. From a brief distributed earlier, and using the Human Of New York style of content creation as a model, participants will file stories for a live Facebook page and Tumblr site (www.tiwis.tumblr.com). We propose to hold a one-hour workshop on the conference day, which will be devoted to the deconstruction of the process of content creation, the artefacts, and the usefulness of the exercise for journalism education. Overcoming the challenges of infrastructure, policy, and guidance in an educational setting first require embedding a digital culture within an institution. 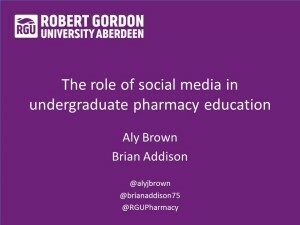 This session will explore solutions to challenges, focusing on laying the foundations for frameworks in social media. Learning Wheels are a simple graphic device to help bridge the gap between traditional teaching methods and contemporary digital learning content and resources. They guide staff through digital technologies by linking platforms, apps and web content to learning delivery.The wheels are based on a developing pedagogy that takes into account four models of student engagement and three modes of delivery. 2) facilitating and developing a theorised, tested approach to developing the practice of academic staff. Participation in the workshop will enable delegates to use the tools demonstrated, acting as facilitators with various stakeholder groups in their own institutions. Providing inspired engagement through interaction with alumni and employers. 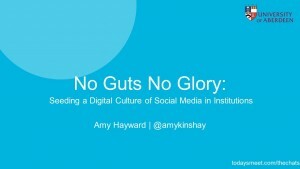 Illustrate benefits and challenges of using Google+ as a platform for discussion activities. 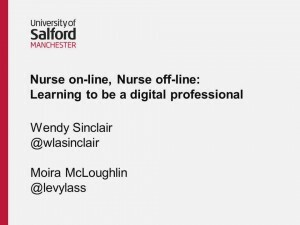 Give an analysis of its usage by students in three different settings at UCLan; patterns of usage, effectiveness in forming learning communities; provide hands-on experience of using Google+ as part of a learning community. 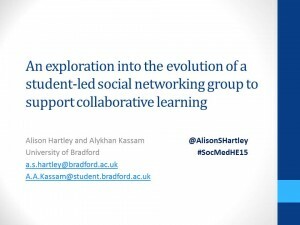 Discover how The University of Sheffield School of English used social media to respond to an active community of learners, crowd sourcing additional material to expand and enrich the learning experience. 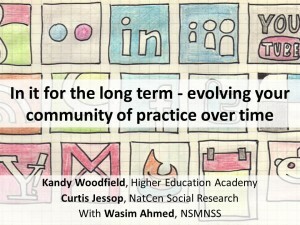 An interactive session during which you can learn how to keep your online community of practice energised over time and consider ways to avoid potential pitfalls. We’ll draw on your own experiences and those of our #NSMNSS network to co-create a set of top tips for community resilience. We’ll provide guidance and resource links for building, nurturing and sustaining your online learning communities. 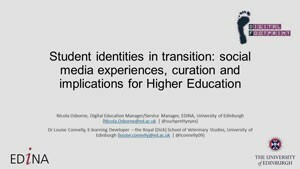 While the use of social media in the HE is encouraged to what extent does a university communications strategy constrain or a signpost the continuum of change and ethical considerations? Social media (SM) is everywhere in the society and its usage is expanding at a fast pace all around the world, especially among the students. However, little is known about how much, why and how medical students use SM and the way it affects their learning. This study aimed to determine whether there is an association between SM use and academic grades and to assess the pattern, extent and reasons of its use among medical students. 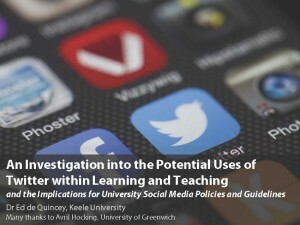 The focus of this study investigates current institutional practice of the use of social media to support and enhance learning. Our short paper shares survey findings; highlighting both enablers and barriers for what is for many, still considered innovative practice where peers are calling for guided support. Hear what learners themselves are saying about the pedagogic possibilities of social media from a bottom-up, student-led approach to collaborative learning. How and why does such a community evolve? Is it influenced by their classroom experiences? How can this impact on our own educational practices within these shifting pedagogies? 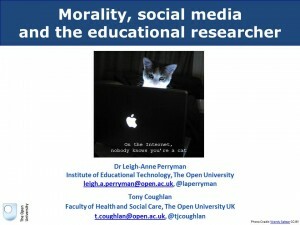 Educational research in social media spaces involves moral dilemmas often absent from traditional ethical guidelines. For example, the public/private distinction can be blurred, individuals can be prone to confessional activity, and informed consent can be difficult to obtain. Here, we discuss how the responsible researcher might manage such challenges. Five years ago Facebook groups were set up for Level 1 Mathematics and Computing students as an alternative to Peer Assisted Learning sessions. Due to their success more have been introduced and we now have subject groups for the whole College of Science and Engineering. Effective pedagogic use of social media often requires the ability to locate tools which support a particular type of interaction. We discuss our attempts to identify and formalise these types of interaction, and show how this can be used to aid (and perhaps automate) the selection of appropriate tools. 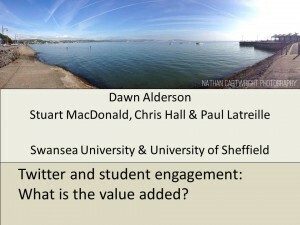 Twitter and student engagement: What is the value added? 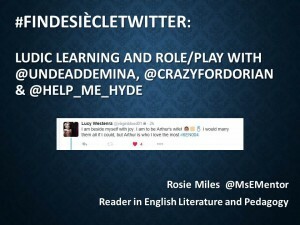 This session refers to qualitative research about third year undergraduates’ use of Twitter during lectures; with a focus on student engagement, specifically the cognitive dimension (HEA). Reference will be made to the methodology adopted for small-data analysis in order to consider findings that show the value-added of Twitter’s feedback loop for student reflective activity. This paper reports on results of a questionnaire completed by 333 respondents on the use of social media in teaching that explored how extensively SM were being used in teaching, educators’ intentions in integrating these tools into their teaching, and their successes and/or difficulties in using the tools. 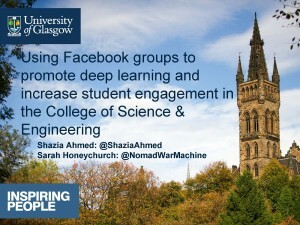 Students increasingly arrive at university with a range of existing social media presences. In this paper we will explore how students conceptualise and manage their online presence, and how this aligns with professional social media best practices. We will then discuss implications for teaching and learning in practice in HE organisations. This paper presents an innovative use of role-play using twitter as an example of what Kolb and Kolb term “ludic learning” (2010). The potentially changed and challenged tutor’s role, students teaching each other, issues of privacy and the encouragement of the carnivalesque are all discussed. 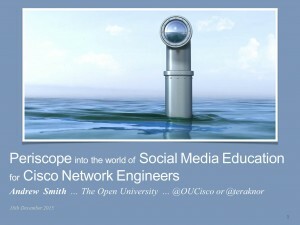 Over the summer of 2015, the Open University Cisco Networking Academy conducted experimental teaching sessions with social media live streaming (via Periscope). Focussing on microteaching a practical skill in approximately ten minutes, these sessions have been recommenced from Oct 2015 as a weekly event. This short paper will share the outcomes of this approach. 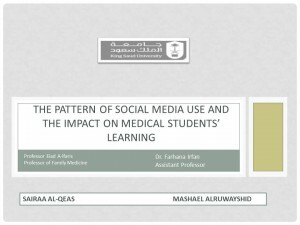 This paper explores the use of social media within a blended mode of study. 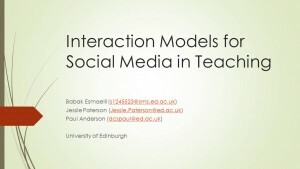 Specifically, it aims to consider the professional use of online social contexts to support teaching and encourage collaboration between learners. It will illustrate some factors intended to protect their digital identities, confidence and online well-being. We will report on our experience with integrating an introductory campus-based module for MSc students with our MOOC in real time. 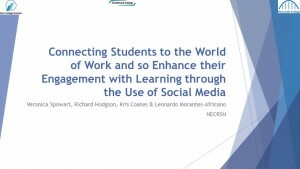 The objective was to encourage our students to develop their online networks for learning and professional purposes, by sharing experiences and building relationships with a global community of MOOC learners. The aim of the paper is to present findings from an empirical study which explores the mediating roles of technology during the initial professional development of trainee accountants. During this process, the trainee accountant has to demonstrate development of their professional identity and competency for assessment purposes. I aim to show the process of developing an online identity using Twitter whilst growing in digital confidence and capability. I will share my experiences as part of the @uwslib team and illustrate lessons learned along the way from this continually evolving account. This short paper presents a study which used a fictional identity on Twitter to reinforce traditional channels of learning and teaching by disseminating resources via this identity’s Twitter feed. Developing digitally literate HE staff: an exploration of the challenges of encouraging staff to develop their own digital/social identity to equip them with the confidence to contribute to the development of the digital literacy and professional identities of students. A case study through the lens of working with careers practitioners. This paper reports on using Twitter as part of a undergraduate module focused on child and family policy. The paper presents an overview of the results and an evaluation of the potential uses of Twitter to promote learning and engage students in real world contexts to develop their professional identities. 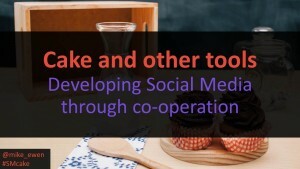 The talk aims to provide practical advice on developing relationships at local, regional and national levels to develop a networked approach to social media. Most academic subjects include topics that staff find fascinating but students do not want to learn. This paper considers how the use of social media (Facebook and Twitter) has been used to engage reluctant students and evaluates the challenges, questions and successes of using a wider range of learning tools. The session will explore the possible uses and impact of social media in the widening of accessibility in Higher Education, for Students with Disabilities. It will analyse and present data collected on a large Canadian campus over a four year drive to implement Universal Design for Learning. This paper will explore the opportunities and challenges of introducing social media channels to support a distributed learning community. In particular, it will focus on the use of Twitter to support a global cohort of postgraduate education students at The Open University. 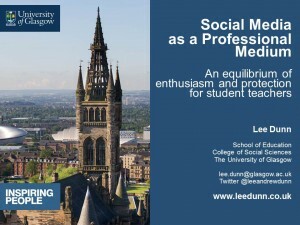 This thunderstorm session will give an overview of an assessment task we designed to help students understand the value of their informal knowledge of social media within the job market. Working as consultants on live briefs with real world clients, students’ engagement, standards and employability comprehension have all increased. The focus of this Thunderstorm session is to showcase the collection of short animated videos that have been created by Andy Tattersall using Adobe Voice. They focus on several themes including discoverability, curation, impact, collaboration and productivity. The collection of videos are hosted on iTunes U, YouTube and Vimeo. 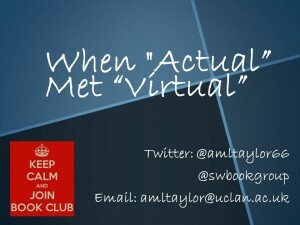 A 10-minute opportunity to interact in a Flashmob online in a research journal club. Including setting up an online journal club and deliberating the advantages and challenges of this innovate activity. 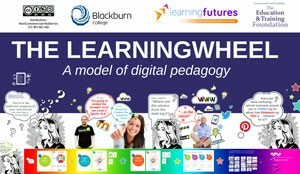 The focus being to enhance tutors own creative teaching, learning and digital literacy skills. The popularity of social learning signals the potential to transform learning into a lifestyle. 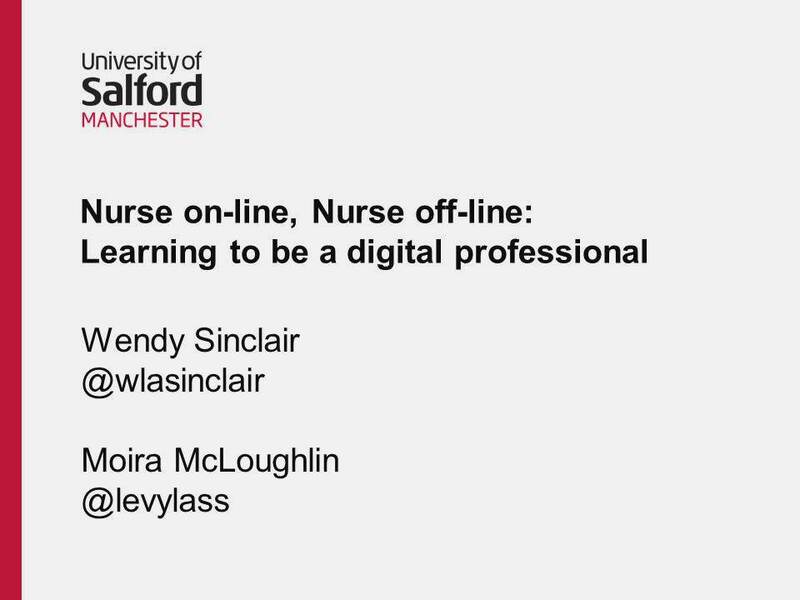 This presentation looks back on a series of Google Hangouts broadcast in 2014 during the Open University Moons MOOC and explores how presentation styles and formats can enhance engagement with informal learners. Over the past three years I have been writing short (~500 words) blogs to supplement lecture material. I will explain how these blogs link to the lecture or to professional development through wider exposure to the subject matter. I will also show how these have expanded my learning network. The aim of the study is to demonstrate how the use of Snapchat can be used in the lecture theatre to increase engagement in the classroom between lecturer and student. The objective is an attempt to increase student retention and improve performance.